First - I LOOOOVED this book! Second - I was so excited to finally do my review, because I LOOOOVED this book LOL. No, this is not your typical mystery/paranormal book, but that's what I loved about it. This book just "hit me", I got it, it connected with me! Don't you just love when that happens? When you start reading and you just know - this is the book for me! I fell in love with this book after the very first chapter. It was freakin hilarious! I was laughing so hard, with tears in my eyes all throughout the book! It was exciting, adventurous, and hilarious! I tried to take this story seriously, I really did. But that is hard to do when you are literally laughing all the way through. I also loved Goom and Jack, and Kyle (who was really Judith anyway)- everyone was very well done. There is a LOT of swearing but... primarily from one character. So it was very realistic. Normally I don't like a lot of swearing, but strangely enough I didn't mind it here. It worked! You just expected it from that character, Goom, and it made the book even funnier. He very much reminded me of the character, Ula from "50 First Dates", played by Rob Schneider. Everytime I read about Goom I kept picturing him! Now this book is definitely not for everybody! But it was definitely for me! It was pretty crazy, but it was all that craziness that I loved. Thank you Partners in Crime for sending me this book for my honest review! 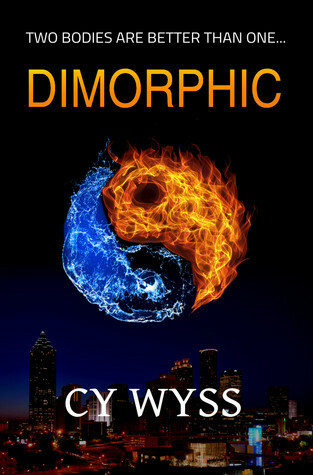 Sign into Goodreads to see if any of your friends have read Dimorphic.